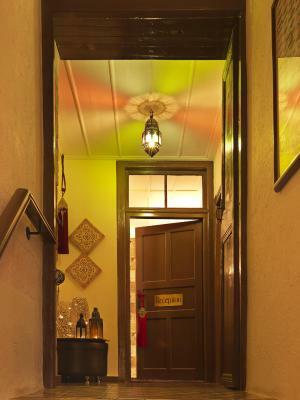 Lock in a great price for Alcanea Boutique Hotel – rated 9.6 by recent guests! 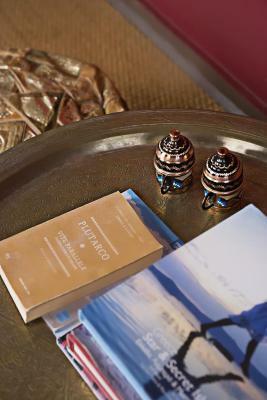 Everything - Beautiful boutique hotel, delicious breakfast, but the best was the staff who were so friendly and caring and made us feel like family! The staff were wonderful, engaging and a pleasure to speak with. I highly recommend this hotel and will, hopefully, be going back soon. 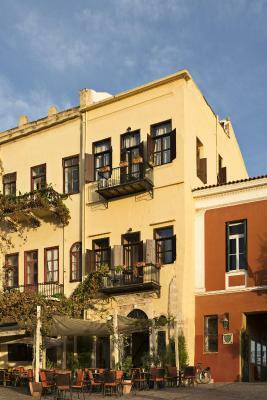 This is a great, small hotel in a perfect location for Chania! 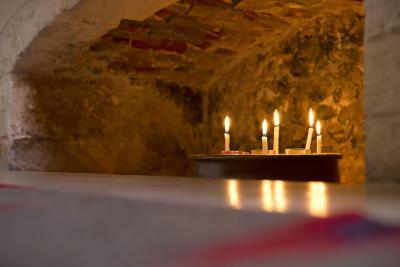 We had one of the smaller rooms but it still was lovely with a nice view and adequate for two people. The other room that our friends were in was much larger and really nice but the hotel is small and all the rooms are different - book early! 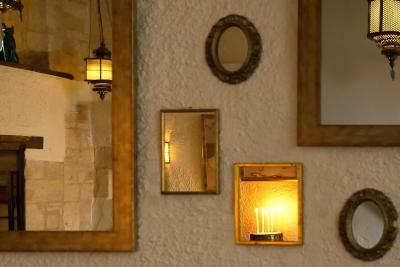 The staff was so helpful - particularly reception and restaurant- answered all our questions, made dinner reservations, helped us in and out of the old town, and always took time to visit! The breakfast was by far one of the best we have ever had in Europe- loved the spinach pie over yogurt and the vanilla cream pastry - Greek food is the best! The staff couldn't of been more helpful. A small example was that the staff walked to a restaurant to speak to them about our reservation when the restaurant did not pick up the phone. Tried to buy a glass of wine and they wouldn't let me. Lovely location!!! 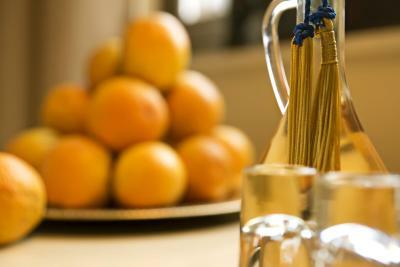 Tastefully decorated, friendly helpful staff, nice breakfast. What a great little hotel. 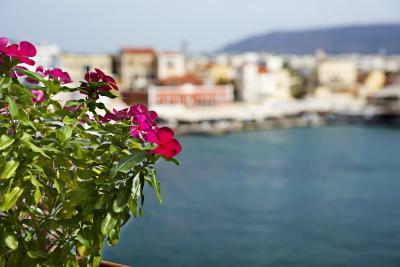 Location was perfect in old town Chania. 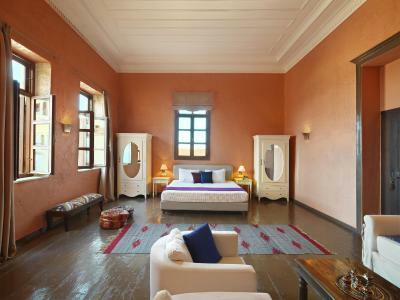 Room was very nice, antique and modern both. Breakfast was out of this world phenomenal! Staff was so nice and helpful. 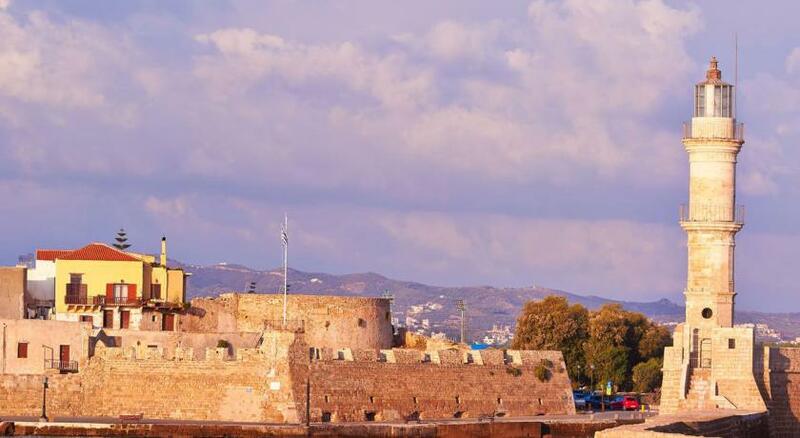 If Greece didn't have so many islands to see, I would be coming back here for sure. Maybe I will anyway. Go to Balos Beach via boat too. Location is literally on the harbor. Our room was small but the other rooms I saw looked bigger. Wonderful staff!! Santorini is all about the view! The patio was much bigger than expected. The angle of the patio to the view of the Caldera was perfect. 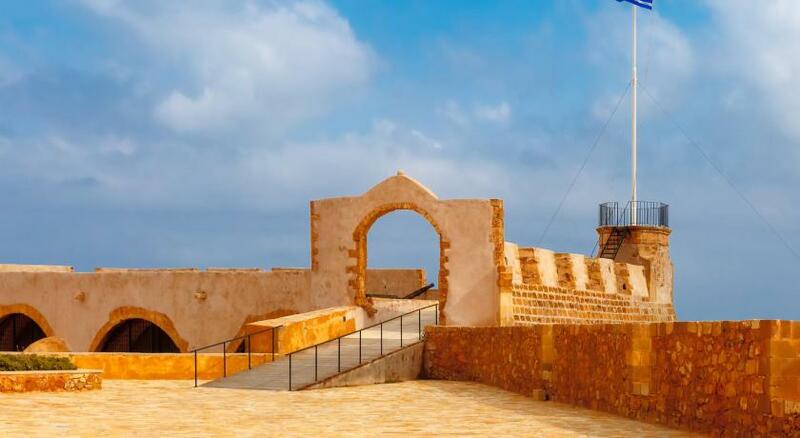 Location in Firostefani was the right choice! The pictures of the house don not do it justice, it's better! 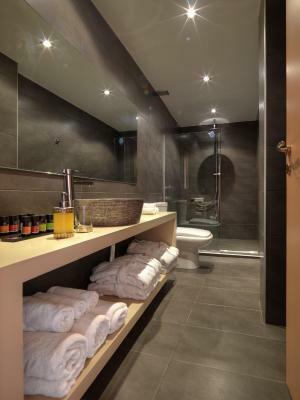 Alcanea Boutique Hotel This rating is a reflection of how the property compares to the industry standard when it comes to price, facilities and services available. It's based on a self-evaluation by the property. Use this rating to help choose your stay! 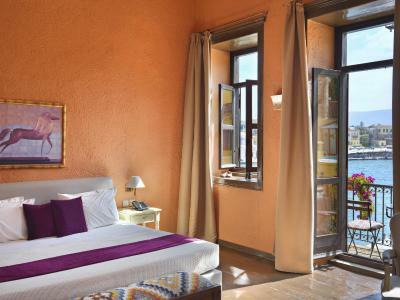 Alcanea Boutique Hotel has a unique waterfront location in Chania’s historic district. 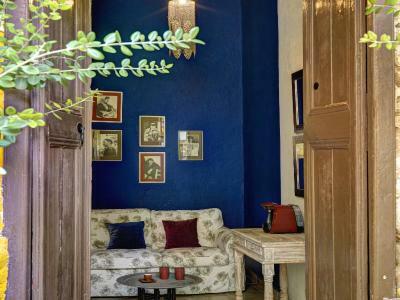 In a historic building, it features a wine bar with scenic views of the Old Port and an elegant courtyard surrounded by flowers. 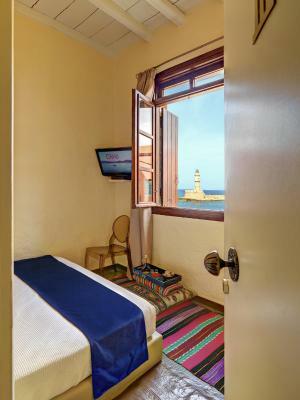 Alcanea’s carefully designed, air conditioned rooms have views of the scenic port and landmark lighthouse. 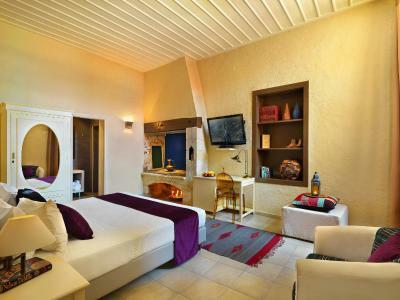 Each is equipped with internet access, a flat-screen TV, minibar, and iPod docking station. 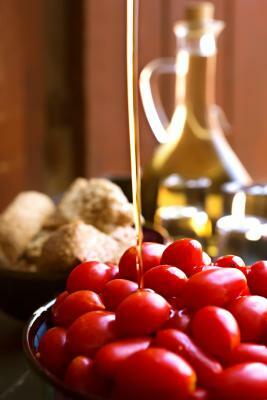 Bathrobes, slippers, a hairdryer and natural body care products are provided. 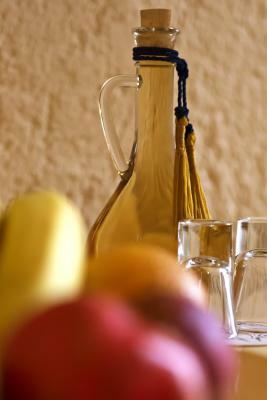 Alcanea's signature breakfast includes Cretan products. 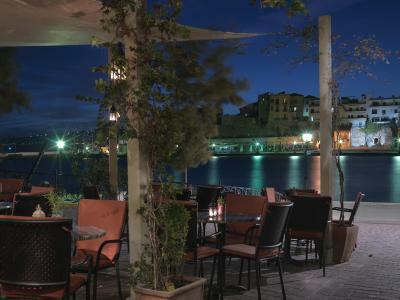 Offering an enchanting view of the Old Port, the Alcanea Café & Wine Bar serves cocktails and fine wines. 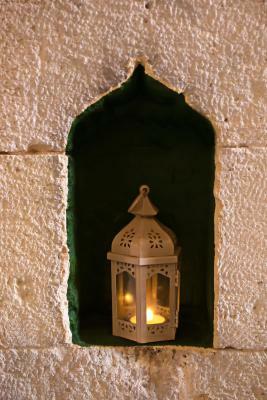 Guests can enjoy Greek coffee or herbal tea at the interior courtyard. Arrangements for taxi transportation services and car rental, guided tours and excursions, restaurant recommendations and reservations are available. 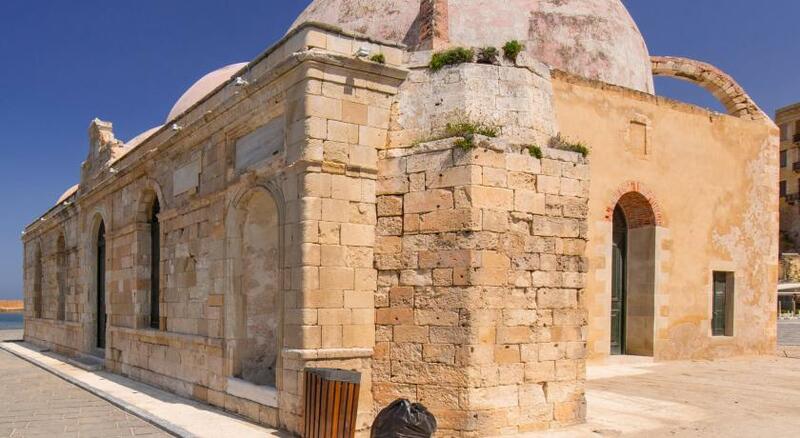 The hotel concierge will help you plan the perfect break in Chania. The nearest beach of Nea Chora is just 1,000 feet away. 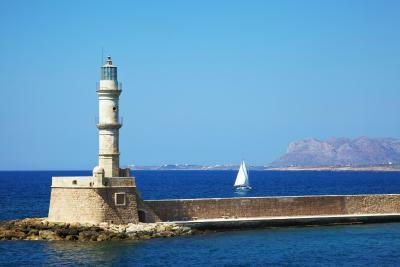 Souda Port is just 4 miles from the hotel, and Chania Airport is 11 miles away. Free public parking is available close by. 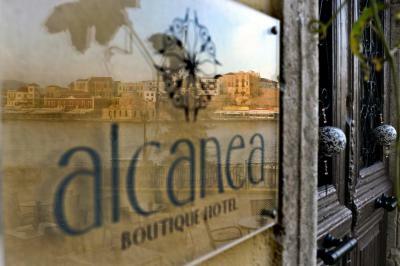 When would you like to stay at Alcanea Boutique Hotel? 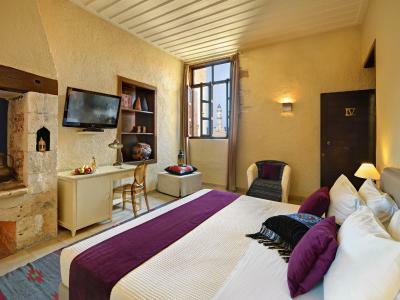 This room provides a queen size bed, a built-in wardrobe and a bathroom with a shower. 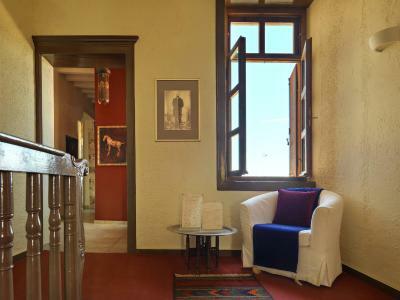 It has 2 windows with views of the Cretan Sea and the Venetian Lighthouse. Please note that there is no capacity for extra beds or baby cots in this room. 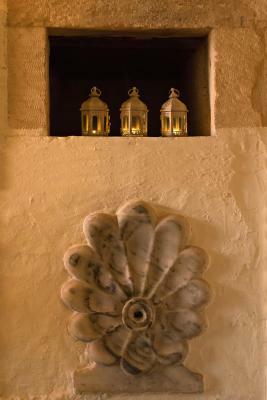 Located on the second floor and looking onto the Lighthouse, this room offers a king bed, a vanity table and a lounge area with a fireplace decorated with Arabic elements. 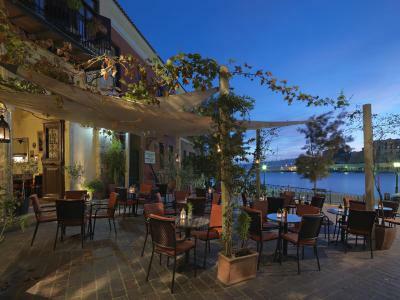 This room is located on the first floor and features a private terrace with panoramic view over the Venetian Harbor. 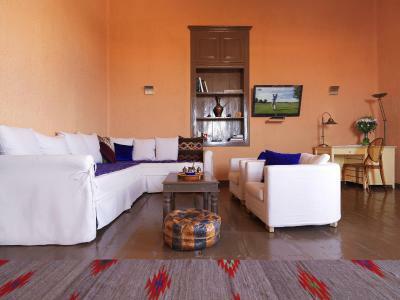 It features a king size bed and a lounge area that can accommodate up to 2 extra guests. 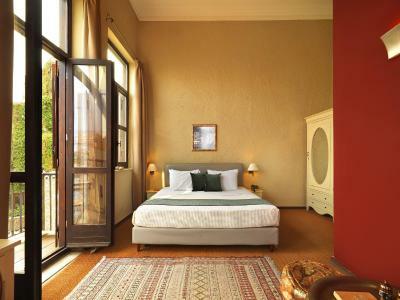 Located on the second floor this room offers views over the Firkas Fortress.It features a king size bed, and lounge area that can accommodate up to 2 extra guests. 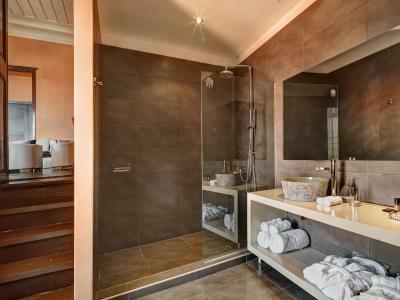 The modern bathroom has a spacious shower and double washbasins. 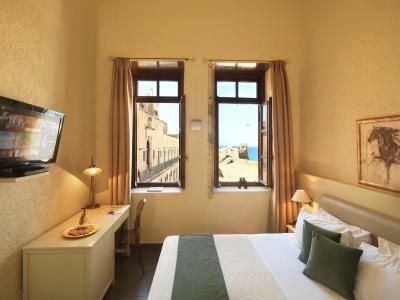 On the second floor, this room offers views of the sea and the Castle of Firka. Please note that there is no capacity for extra beds or cribs in this room. 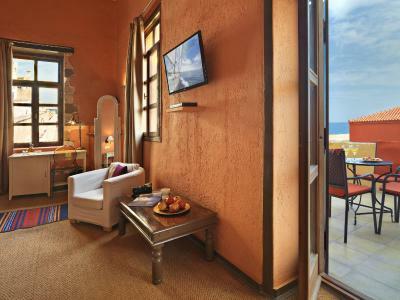 This room features a private terrace with sea view. 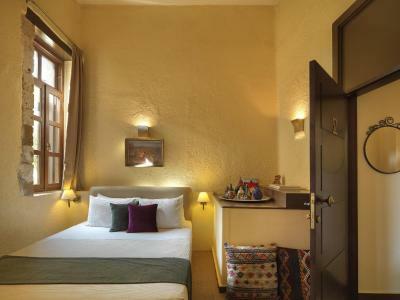 A pleasant room located on the second floor; it has a window above the hotel's internal patio, but it has no special view. There is no capacity for extra bed or baby cot in the room. 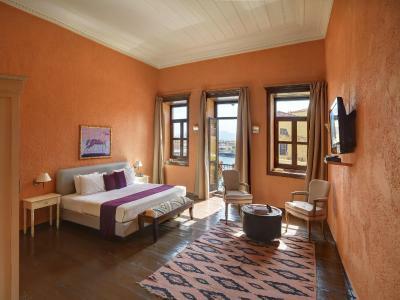 Located on the second floor, this room opens to a terrace overlooking the Old Port. 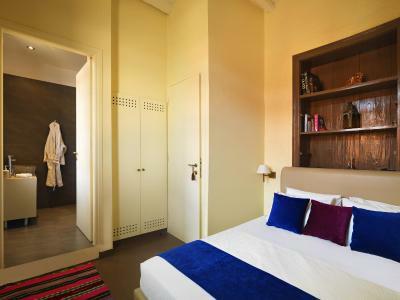 It offers a king size bed, a dressing table and a bathroom with shower. 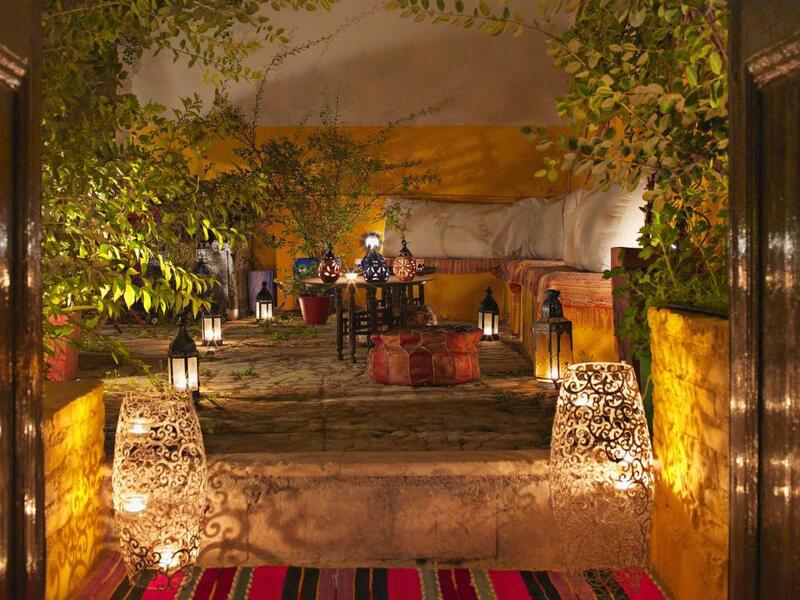 House Rules Alcanea Boutique Hotel takes special requests – add in the next step! 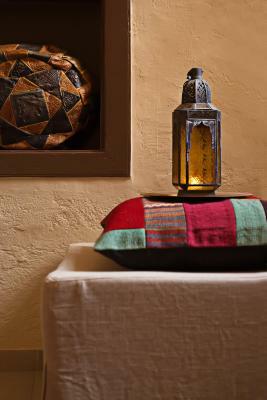 Alcanea Boutique Hotel accepts these cards and reserves the right to temporarily hold an amount prior to arrival. 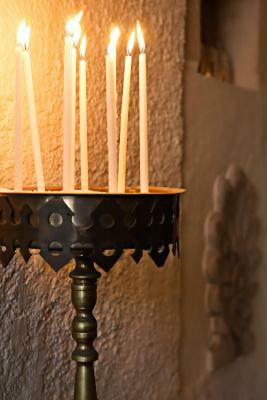 The staff are exceptional with amazing hospitality and they really go above and beyond in all situations! They really make the hotel very special! 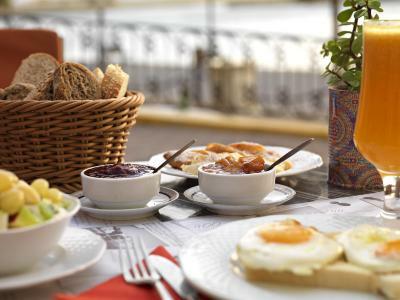 The breakfast is delicious with a great selection. 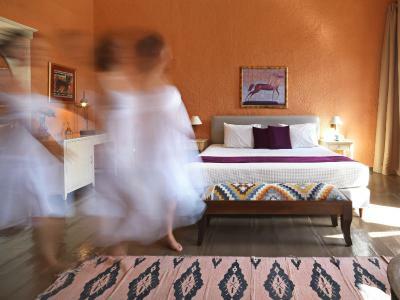 Location is excellent, the decoration of hotel is beautiful with extremely clean and comfortable rooms with beautiful views. The wifi provided, while adequate, did drop out for me from time to time to the point where I eventually resorted to using my mobile phone as a wifi hotspot. However, it is free wifi, and when it did work it was perfectly up to the job of calling home before cutting out. The staff were incredibly attentive, engaging in email conversations with me regarding my special request for a teapot to be included in my room. 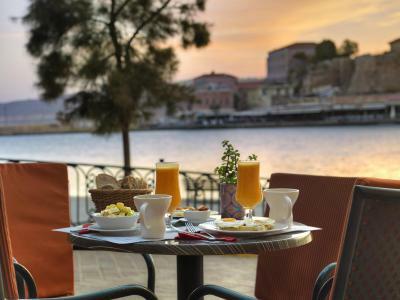 The breakfast in the morning was fantastic, being served all the way up to 1200, and selected from a good range of food and drink. I was pleasantly surprised that the orange juice was fresh rather than from a carton! It's the little things that make the big differences. The stairwells could have been upgraded- and would be challenging for someone with mobility issues. Parking in public parking/on streets we were prepared for but can be a challenge. 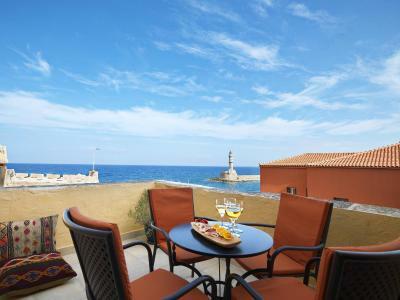 Perfect location for a relaxing few days in Chania. We slept in, enjoyed breakfast served until 13! Had the perfect view from our room. The staff were attentive and helped plan a special occasion, helped booking restaurants, taxi, and source crutches on short notice. Can highly recommend this hotel. We travelled with children and in-laws. Everyone was happy. 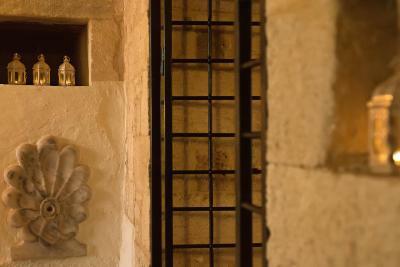 Wonderful host in Elena. 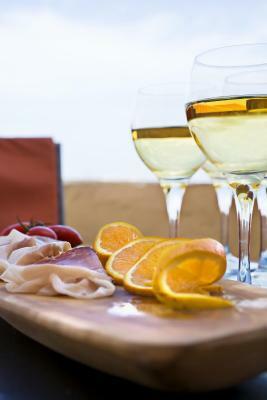 Great restaurant recommendations and assistance with tour. 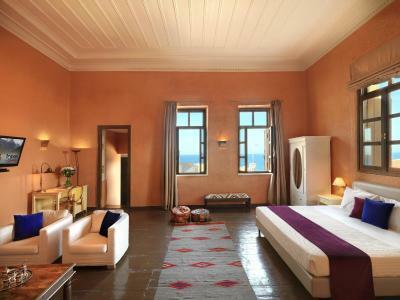 Beautiful room in a fabulous location. 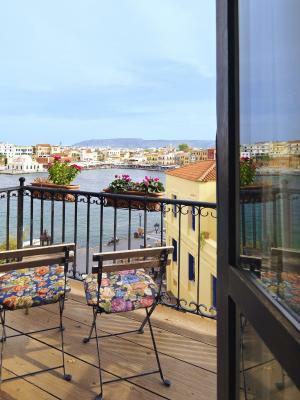 Beautiful location in the heart of old Chania Port. Hotel very atmospheric, and most of all the management and staff were very friendly and helpful in all aspects - it was like a family home. This was the best time on our trip. 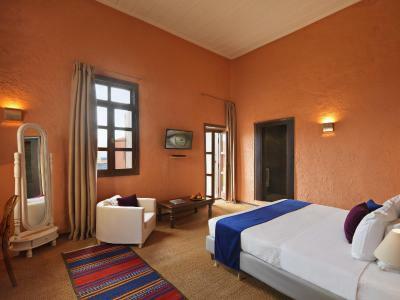 Hotel had also referred us to Alma de Crete , a wonderful agency for touring the area. Perfect location at one end of harbor. Wonderful staff . Exceptional breakfast. Our room was the smallest (and cheapest) but still had a great lighthouse view. Cozy! The extra charge for a poor room. 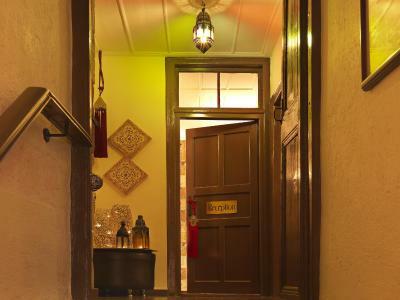 Beautiful hotel, old world charm, amazing location. Eleni/Helen on the front desk was so helpful and lovely!